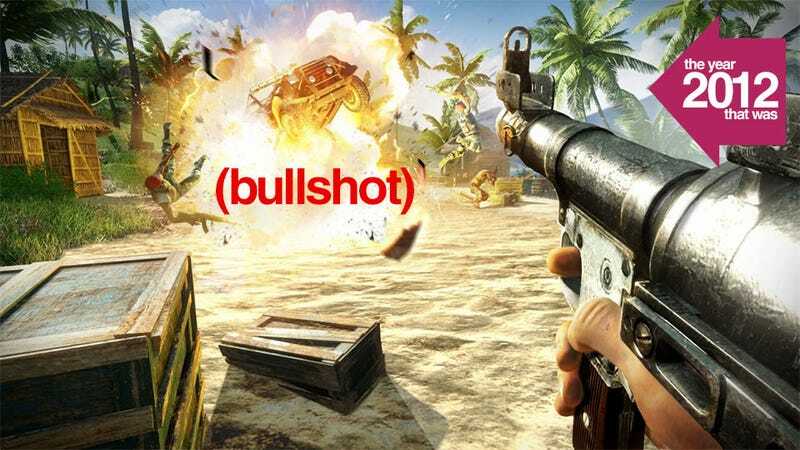 It was back in 2005 that Penny Arcade first coined the term "bullshot", giving a definition to the practice of doctoring video game screenshots to make them look better than the game actually is. You'd think the intervening seven years, the rise of the video trailer and a growing awareness of the practice would have seen bullshots go away, but no. They're still around, and still as bullshotty as ever. In this post I'll be collecting some of 2012's worst. Scroll through the gallery to check them out, and if there's a good one I missed, drop it in the comments below and I'll see about adding it in! To craft a screenshot artificially takes patience. Restraint. It can be tempting to fill your image with EVERYTHING THE GAME HAS, but most people don't, because that would look stupid. Like this screenshot. This is a video game, guys, not a 1980s GI Joe commercial. Assassin's Creed III is an ambitious game, and while in parts it can look stunning, for most of the game you actually notice it looks a little... bland. Janky, even. Not that you'd have known that before the game came out, going by screenshots like this. This is not a Far Cry 3 screenshot. It's an artist's impression of what Far Cry 7 will look like on a gaming PC in the year 2019. This goes for any EA Sports game this year, or even any sports game, but there's something a little extra in FIFA 13's bullshots, like the quality of the grass or the clean lines in the depth-of-field effect, which sure as hell doesns't look that nice when you're actually playing the game. Wait, did Halo 4 get a PC version running in 1920x with AA out the wahzoo? No? Oh. The PC version of the game looks good, but not this good. This is actually a great textbook example of a classic bullshot. The actual assets used haven't been messed with too much; Agent 47's head is still clearly polygonal, for example. But there's a sheen to everything, like the devs took the game's already heavy bloom lighting and smeared vaseline all over it.